TO INFINITY AND BEYOND! With the help of Sand Creek Brewery in Black River Falls, Matthew Rick of Infinity Beverages in Eau Claire has created Beerskey. Ask a college student about the perils of mixing alcohol – namely spirits and beer – and you’ll likely be treated to a little ditty proclaiming, “Beer before liquor, never been sicker; liquor before beer, you’re in the clear.” But, what happens when you consume the two potent potables at the same time? 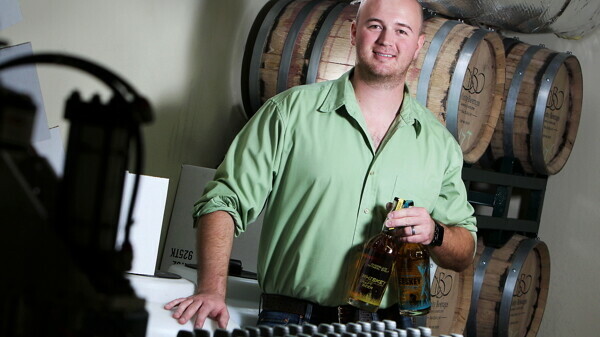 Matthew Rick, of Infinity Beverages, may have broken through the pint-glass ceiling with his craft beer infused whiskey, aptly titled Beerskey. Fittingly, the idea was hatched over drinks. “A friend and I were having a few cocktails one evening and we began discussing the project,” Rick explained. Luckily, that friend had a massive supply of a summer-style Hefeweizen that Rick could tinker with. “It wasn’t enough to produce a truly finished spirit, but I knew immediately after tasting a sample that the project truly had some potential,” said Rick, who creates, serves, and sells wine and spirits out of Eau Claire’s Banbury Place. The creation of Beerskey isn’t done by cracking open a cold one, dumping it in a cask and shaking it up, though. It’s a much more complex and elegant process. Both branches of booze are made using grain – one has to make beer first and then distill it to create spirits. Rick’s process takes beer and double-distills it to create a raw whiskey spirit. The spirit is then aged in barrels for six to nine months (because grooving on the insides of the barrels allows for a faster oak extraction and accelerated maturation). Whiskeys are typically forged using ho-hum, stripped-down “grain bills” (think of what goes into run-of-the-mill brews like Bud, Miller, or Coors). But by using microbrews from Sand Creek Brewery in Black River Falls, Rick created a more complex and full-flavored sipping whiskey. For now, the Beerskey line incorporates two different Sand Creek brews – which were chosen for their distinguishing flavor profiles – in its two signature specialties. The first uses Oscar’s Chocolate Oatmeal Stout – a World Beer Cup gold medal winner – to create a toasty whiskey with flavors of rich smoke, chocolate, and a hint of oats. The second beer employed was a limited-release doppelbock, with notes of spice, toasted caramel, butterscotch toffee, and nut. They each launch Nov. 4, and a special tasting event – during which celebrants will be ferried between Infinity and Sand Creek in an Excursion limousine from Cody Limousines – is planned for Nov. 8. Rick explained that the distinct flavor of the whiskey is derived from the craft beer in its DNA, whereas traditional whiskeys obtain their flavor profile from being extensively oaked. While Rick enjoys his beverage with a few ice cubes, he’s in the process of creating a signature cocktail recipe list for his customers. “With the immense flavor complexities, it will surely allow for the creation of distinctly flavored cocktails,” Rick said. Now that’s something we can all raise a glass to.